How Did Our Real Estate Market Improve in 2016? We have some great news to share today. The numbers for our real estate market were up across the board in 2016. 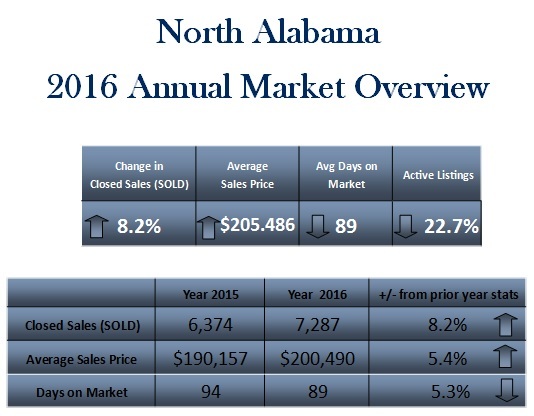 The North Alabama real estate market had an incredible year in 2016, especially considering the naturally low consumer confidence during an election year. We are happy to report a positive improvement in all categories in 2016 over the previous year. We took a look at the year over year data from 2016 and compared it to 2015. 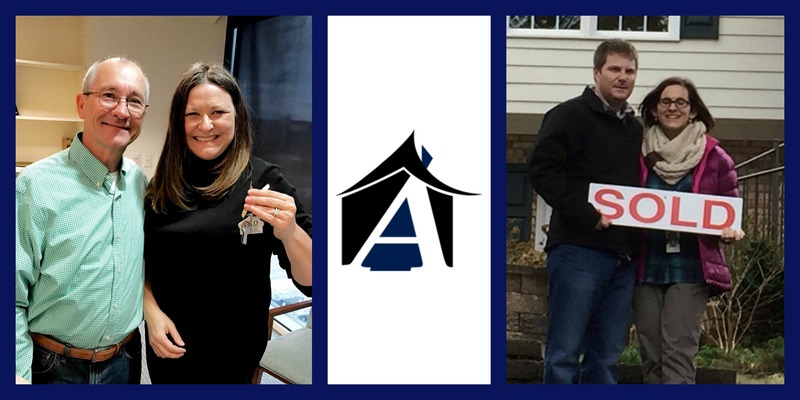 At Amanda Howard Real Estate, we experienced a record-breaking year by helping 710 families, which is 11% more than we helped in 2015. As far as the year over year data goes, the largest increase we saw in our local market was the 8% increase in total residential sales. We experienced a seller’s market for most of the year and saw a decrease in our average days on market by 5%. Homes were on the market for an average of 94 days in 2015, but they were only on the market for an average of 89 days in 2016. We are commonly asked about the average price point and how home values are doing. We have good news to report here. We saw an increase in both the average list price and the average sale price. The average list price went up by almost 5% in the last year and the average sold price increased by just over 5%. The average price point in the Madison County area is just under $206,000. That is 5.6% higher than the five-year average. As far as the absorption rate of our current inventory, it will be very interesting to see what happens. It is typical for this time of year to have lower inventory when you combine the fact that whenever there is a change in the political climate, real estate tends to waft to a lower level, individuals get back to their current states of being comfortable, and then they’re ready to make a move. Therefore, this combination has created a deficit in the homes available for sale to the tune of 5.2 months of inventory to sale ratio for 2016. This is a decrease of 22.7% from 2015. 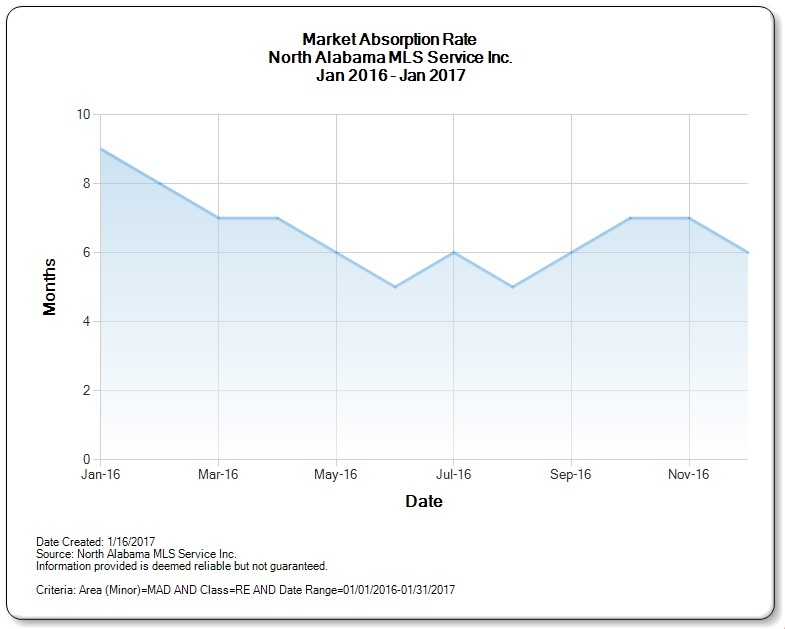 Keep in mind that the market considers six months of inventory a balanced marketplace. I hope you found this information helpful. If you have any questions about these reports or would like additional information, don’t hesitate to reach out and give us a call. We would also love to hear from you if you or someone you know is interested in buying, selling, or investing. Have a great start to the year! Mr. Ralph W. White Jr.